As previously mentioned, my latest body of work has an element that is very personal to me. 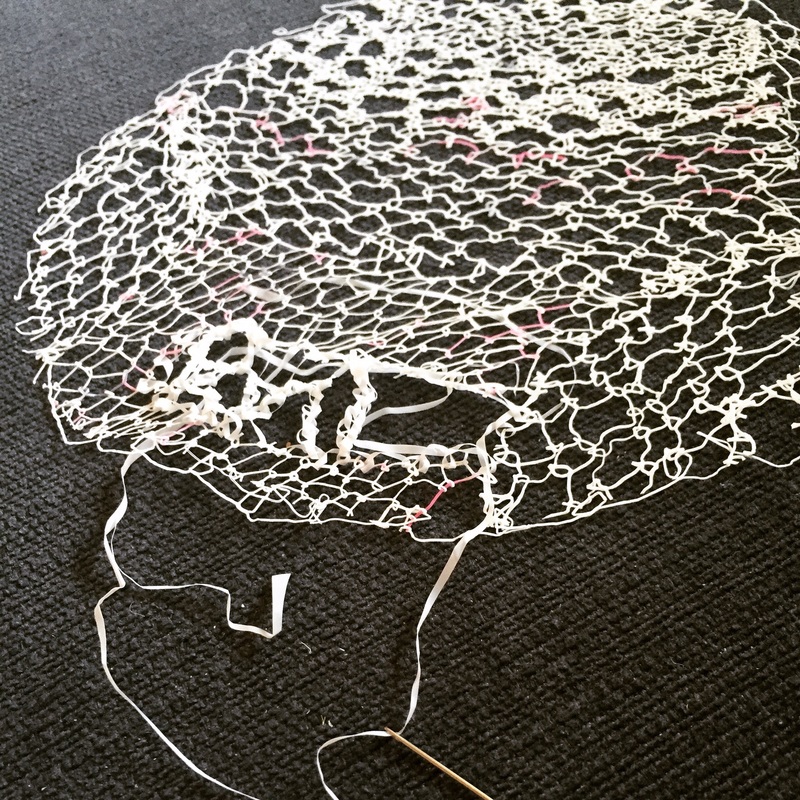 I am creating large scale pieces, which include text within the lace components. This is a technique I have been fine tuning for a while now. There is always an element of risk that the text won’t turn out quite as planned. However I really enjoy the challenge of adapting, and being thrilled when something turns out better than expected. Every stitch varies, and every piece (as with all Eternal Lace) is one of a kind. 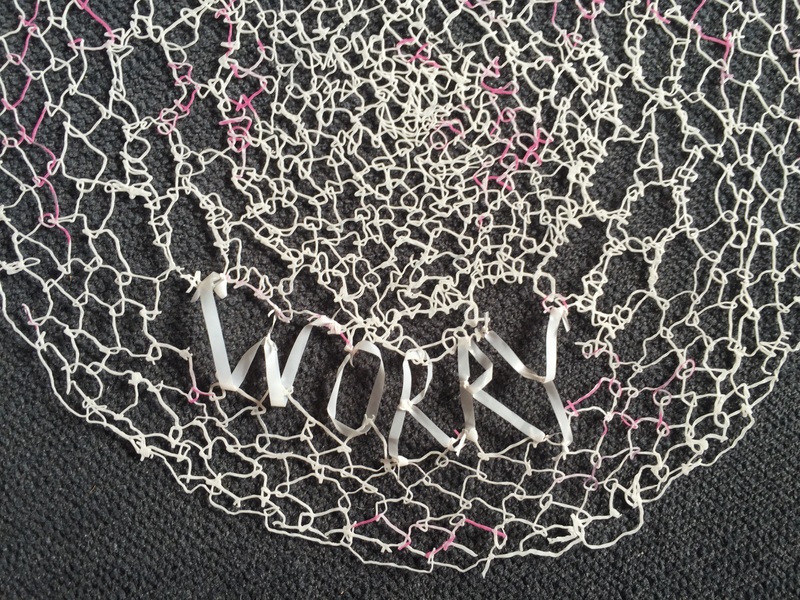 The concept behind the pieces is to reflect the control that anxiety and panic can have over sufferers of these conditions. I have always been an anxious person, however it has almost taken over my life over the last year. It is something many people deal with daily. Even with a huge amount of support and love (as I am lucky enough to have), anxiety can make one feel totally alone, and unable to enjoy everyday life at times. As I am feeling more like myself than I have for over a year, I feel compelled to bring this part of myself into my work.The form of the pieces will nod toward the physical hurdles anxiety and panic can cause, and how the sufferer feels in the height of the attack. Sensations of not being able to breath and being out of control are common, however, often this isn’t obvious from the outside. Learning to hide anxiety and plough through everyday life seems to be very common, as I have found when talking to friends and family. It is a vicious cycle which can be broken. Not having any time during the day to produce work, or plan new projects has definitely exacerbated panic and anxiety. I am very happy, and lucky to be able to stay at home with my girls (Scarlett 6, Isla, 3), but I have struggled recently with being defined by that role. Using time to it’s full potential and being more organised is allowing me to at least sketch designs, and prepare materials. I am making the most of time with the girls this Summer before they both head to school/nursery in September! I’m excited for new adventures for us all, and 2 hours per day to create will be my therapy. The knowledge of that, and fun filled summer days to enjoy in the present moment, mean the future is to be looked forward to, not feared.